The lowland rainforests of Madre de Dios, Peru are known for their exceptional wildlife and some of the highest species diversity of any ecosystem on the planet. Tourists flock to see stunning macaws, jaguars, and tapirs and capybaras. This region forms one of the largest sections of untouched Amazonian forests in Peru. Uncontacted indigenous people are known to shelter in the depths of these pristine forests. 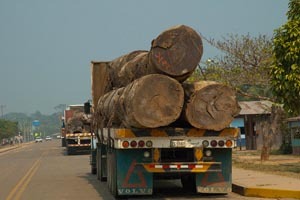 A massive international project, the Inter-Oceanic Highway, is cutting a path from Brazil through Madre de Dios toward the coast of Peru, greatly expanding access to illegal logging, oil and mining development to extract raw materials for export to Asia. The local indigenous and mestizo populations who live on the edges of the new highway are most at risk. 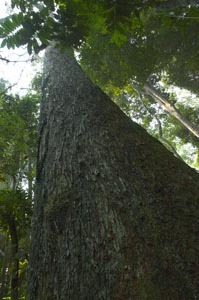 Native tribes and local Brazil nut growers are having a difficult time stopping the onslaught of trucks, squatters, and chainsaws. We are organizing a small group of projects that focus on protecting the threatened lands on either side of the highway, creating conservation easements that protect forests in immediate danger. In association with several local groups, we are developing a more positive and sustainable alternative using carbon financing to allow local people to protect their forests, save the world's biodiversity, and still feed their families.